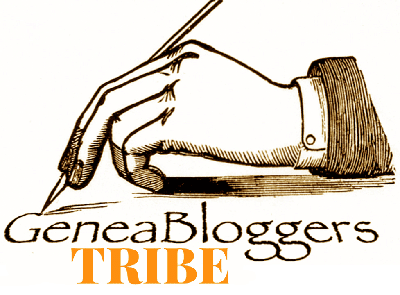 Ancestral Discoveries: Treasure Chest Thursday: Who Has How Much Land? These scans are of both sides of one sheet of 5" x 8" lined paper. The paper seems to be of moderate to poor quality. It has no watermark but does have a distinct texture, and I can see lines running vertically down the sheet. It was folded lengthwise. The writing is all in pencil. This looks like Jean La Forêt's handwriting to me. From Ashby Road to Mid. Golf Club. take a little over 105 feet in width. from Ashby Road to Golf Club. 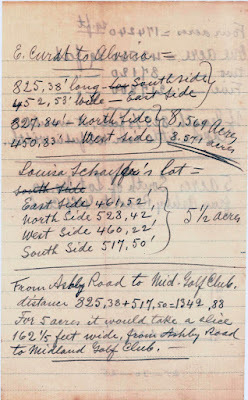 The first two sections of page 1 appear to be measurements of the land of Alvina Curdt (married Schulte) and Louisa Curdt (married Schaefer). Similar to some of the account figures I posted a few weeks ago, Jean came up with two different results for Alvina's acreage. Granted, there isn't much difference between the two — a mere .002 acres — but I have begun to question how good Jean really was with numbers. I admit I don't know how to compute the amount of land based on the figures he's given. 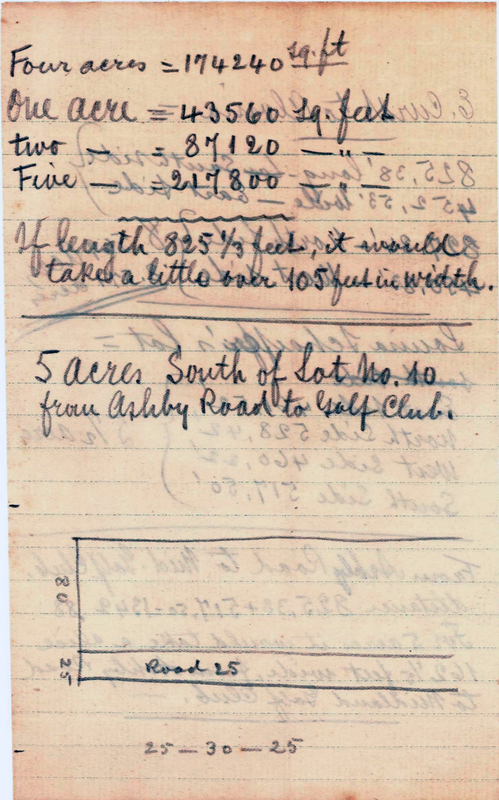 The distance from Ashby Road, which is where the family members lived, to the Midland Golf Club is the sum of the lengths of the south side of Alvina's lot and the south side of Louisa's lot, assuming that the unit of measurement here is feet. That's what he noted for Alvina and Louisa's lots, but I wish he had stated it here. Does that mean that Alvina's and Louisa's lots were adjacent to each other and ran between the road and the golf club? And what does it mean to say that it would take a piece 162 1/2 wide to make 5 acres? Why would he need or want to make 5 acres? The top of the second page is nothing more than how many square feet are in one, two, four, and five acres, although not in that order. Maybe Jean wrote that as a reference for himself, as he worked out how many acres Alvina and Louisa had. 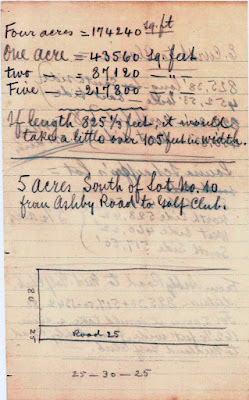 As for his next item, when I multiply 825.33333 by 105 feet, the result is 86,659.9997, just a little less than the 87,120 square feet Jean listed for two acres. Taking that from the other perspective, 87,120 feet divided by 825.33333 equals 105.557351, which is not what I would call "a little over" 105 feet; it's more than halfway to 106 feet. But it appears that Jean was thinking about 2 acres. 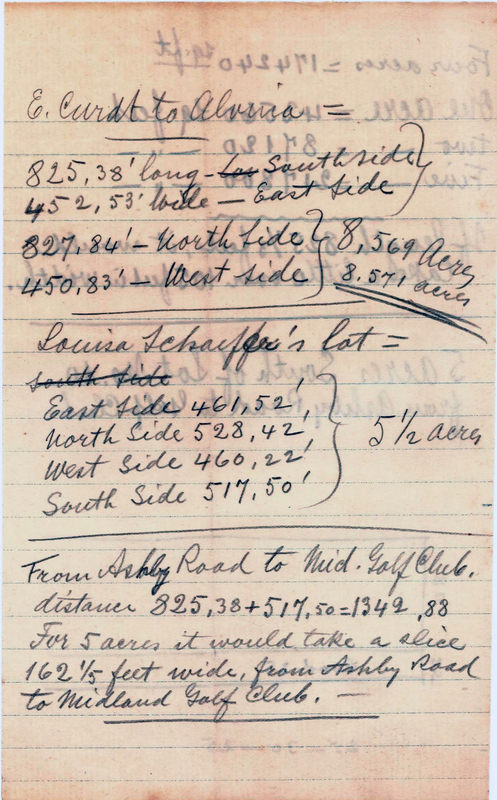 On the other side of the page he noted the south side of Alvina's lot as being 825.38 feet. That 825.38 is almost the same as 825 1/3. When I multiply 825.38 by 105 feet, the result is 86,664.9, a little more than the previous number but still significantly short of 2 acres. Starting with the acreage, 87,120 feet divided by 825.38 is 105.551382, which is still closer to 106 than 105. Maybe he was trying to figure out 2 acres for Emma? In the next section, with the simple drawing, Jean refers to 5 acres. Is this the same 5 acres he wrote about on the other side of the page? None of the numbers written by the drawing — 80, 25, 30 — match the figures he's used previously. If I'm really lucky, something else in this folder will explain what all of this means.